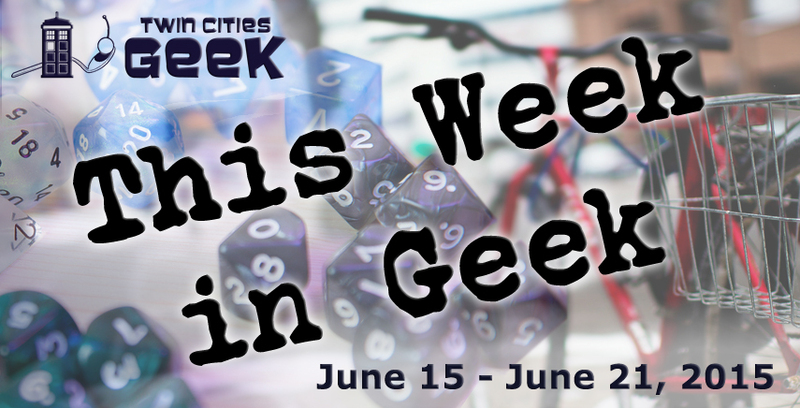 Welcome to This Week in Geek, your guide to events of interest to the Minnesota geek community for the week of Monday, June 15th through Sunday, June 21st. When: Wednesday, June 17th at 8:00 p.m. When: Thursday, June 18th at 7:00 p.m. When: Thursday, June 18th at 6:30 p.m. The Geek Partnership Society’s Crafty Geek club and its sub-club Make It Sew meet Thursday evenings and invite you to “bring your crafty stuff to do” or to “hang out and work with the crafty stuff we have here!” This week’s meeting of these clubs will provide attendees with a specific project to work on, as they do the third Thursday of every month. Tape Freaks Presents: June 18th Mystery Movie! When: Thursday, June 18th at 7:30 p.m. The creators of Don’t Shoot the Masseuse and I (Heart) Brains invite you to a new original comedy: Agent Carlisle. “A once-fearsome federal agent demoted to secretary after a witch hunt gone wrong, Martin Carlisle is finally convinced there are no communists and no conspiracies—just in time to find himself entangled in a vast Soviet plot.” This “Cold War caper of mayhem, madness and redemption” is being performed at the Historic Mounds Theatre in St. Paul this Friday, Saturday, and Sunday as well as next Friday and Saturday. When: Friday, June 19th at 7:00 p.m.
Anime Twin Cities is going to the Vali-Hi Drive In in Lake Elmo this Friday for a screening of three movies for the price of one! If you are interested in accompanying them, they suggest that you bring “lawn chairs, maybe a boom box or two, and blankets.” What they will be bringing is their grill as well as burgers and brats to put on it, but they will need “plenty of people to eat them!” Keep in mind that you can’t pay with plastic, though there is an ATM on-site. When: Saturday, June 20th from 10:00 a.m. to 5:00 p.m. If you like handcrafts, live music, Maypoles, folk dancing, face painting, outdoor games, ice cream, or anything relating to Swedish food and culture, there will be something for you at this annual event held at the American Swedish Institute in Minneapolis. Fun for both kids and adults, the festival is free for ASI members and anyone under five. When: Saturday, June 20th at 8:00 p.m. KA-BAAM!! : The Improvised Comic Book is an “improvised superhero adventure” based on attendees’ suggestions. The first half of the show will see performers improvising the origin stories of superheroes collaboratively created with the audience, and the second half will feature these characters coming together to fight a supervillain. A live artist will also be in attendance, drawing a cover to a KA-BAAM!! comic book during the show that will then be given to the audience member who provided performers with the best superhero suggestion.